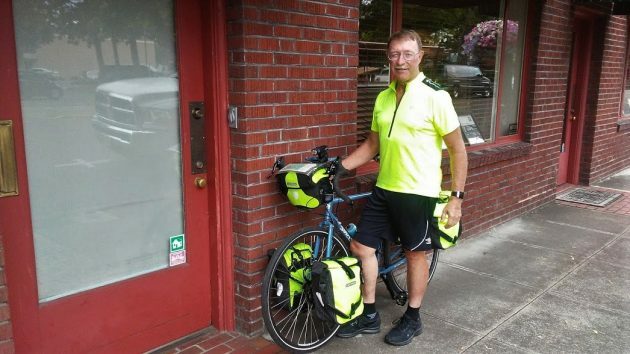 Brann Smith stopped in Albany Wednesday on his way across the U.S. He started in Astoria. On Wednesday Smith came through Albany, where he’s no stranger. Every summer he brings his hot-air balloon to an Albany event, and four years ago he got married in town. He likes the place, and maybe he’ll move here some day. For now he’s from Chico, Calif., from where he operates his Skydancer Balloon Co. Before he did that, he had a career with Nike, running the sports-wear company’s loss-prevention department. He’s 62. So why cross the country on a bike at that age? He and a pal made the trip in 1976, and they resolved to do it again when they were “old.” They were thinking of “old” meaning their 40s, maybe. Lise Grato of the Downtown Association called me Wednesday to tell me Smith was in town. So, in the afternoon I went to chat with him. From where I started, my round trip for the interview was a whopping two miles. But at least it was on a bike too. Three months on a bicycle during the summer seeing this incredible country? I’m envious. Safe travels, Mr. Smith. Once again, a super interesting story about local events. How do you come up with all these entertaining ideas? There is also a self-supported bike race over the same route. They went through Albany earlier this month, and the first riders have just made it to Yorktown in a little over 16 days.